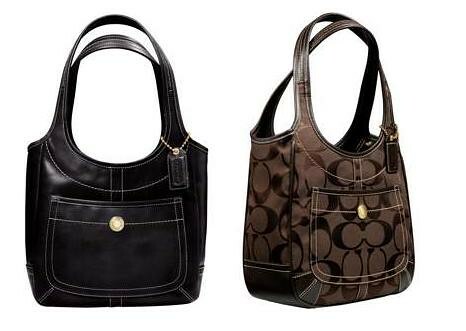 As far as I know, the Coach Ergo hobo is one of Coach’s classics, which is the first bag on the left. The other 2 are relatively new in the collection. To boost the Ergo stable, Coach has come up with even more designs and colours. The designs and colours are available for viewing on the website, but are only available for sale from Friday 25 April 2008. For us here in Malaysia, I guess we can expect to wait a couple of months before we see it on our shelves. Here are a sampling of the new Coach Ergo designs. It looks like Coach is taking the latest fashion trend of having pleats one step further and putting it on their bags. In a way, it makes it easier for fashionistas who don’t like to wear pleats to get with the latest fashion trend. I am feeling partial towards the Ergo Pleated Satchel Frame Tote in burnt orange. I like bright colours in my bags. In the alternative, the Ergo Leather Pleated Tote in white is an option too. I find the lines cleaner in these 2 designs, and the pleats go nicely with the design. I think the Editorial Canvas Tote is a bit of a disaster. It would look so much cuter without that silly looking belt thing around it. As for the Ergo pleated hobo, I find that it looks a bit too messy. Hobos are designed to slouch so I personally think that having pleats and all might just make it look a tad strange when it slouches. But who knows what it might look like in person. I’m not sure what it is about Coach canvas logo bags, but they seem to be looking tackier in my opinion. Don’t all jump on me at once for saying so! I’d say save up a little more and get the leather bags – they last the test of time better too. Coach leather bags are very nice. The 2 I own are both leather and they only get softer and more supple as time goes by. It is also easier to clean leather and it never looks grubby. 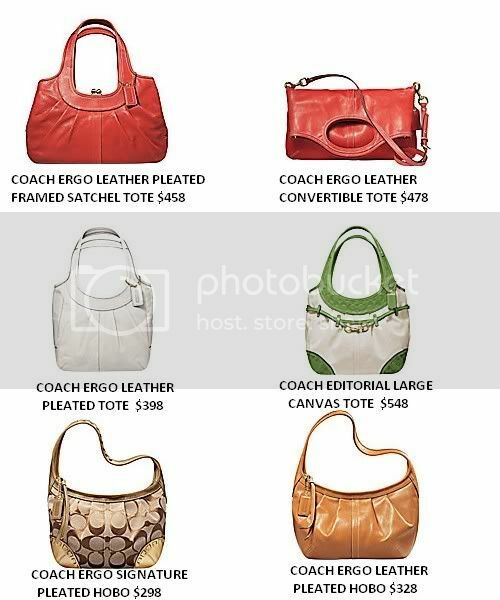 I’ll be keeping an eye out for the new Coach Ergo collection and I’ll report back once I get a hands on feel of it. I just saw the new Ergo design on the Coach site today too! I know what you mean about the logo bag, but all I can say is the logo on the bags need to be done tastefully. I mean I know some people buy the bag specifically to show off the logo, which is a bit stupid la….but done in a right way, the bag looks gorgeous. but these are rather cute. I particularly like the first leather bag. i think it’s great. I only like it logo-ed when its a big tote like the one I have coz at least its not super plain. I want the pleated tote but I think I’m gonna save my money and not get it here. Total rip off. Oh oh..and I saw this little cute pastel purple leather handbag frm Coach too (I dun usually like small bags) and it was just too pretty. Ugh. Nikki: Yes. 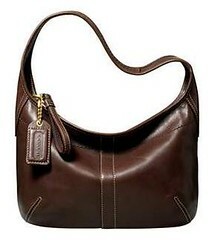 Coach leather bags are really nice and only get nicer with age. Good choice! Giddy Tiger:Yep you are right about the logo. Small tasteful logos maybe but Coach large Cs are too much IMO. S-Kay: Sigh… yeah the prices here are awful. I don’t have access to the USA though else I’d get them there!